This past weekend, Jeff's brother Jeremy came into town, so we needed to show him a good time, and, of course, the Milt had to be included too! Our goldendoodle has really introduced us to the world of outdoor dining. That night all of us dined at a local restaurant that has a terrific patio area peppered with picnic tables and space heaters because it is finally that time of year in Dallas when sweaters and boots are making an appearance. 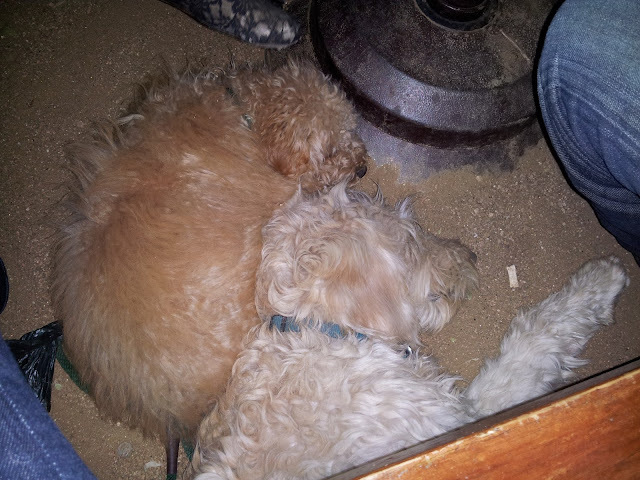 Milton and his little buddy, Leo, cozied up under our table while the night marched on by them. That evening I was the first to drive home at the modest hour of midnight. These two party animals napped and saved up their energy for a much later night out. Sometimes, Milton puts his Momma to shame by how much more fun he is! How cute - I should take Stanlee out to lunch, what a great idea. Can't imagine sweaters at this time of year, we just spent the weekend at the beach. It is 35 degrees right now in Northern Indiana and Zoey is loving the chilly fall weather!